Someone took a quick snap of my great grandmother Margaret Pepperney Lowry as she was standing on the sidewalk. I believe this was taken in the mid-1940s. I’ll need to check with my dad where he thinks this may have been taken. I would also love to know more about the car. If you can identify the make and model, please leave a comment! 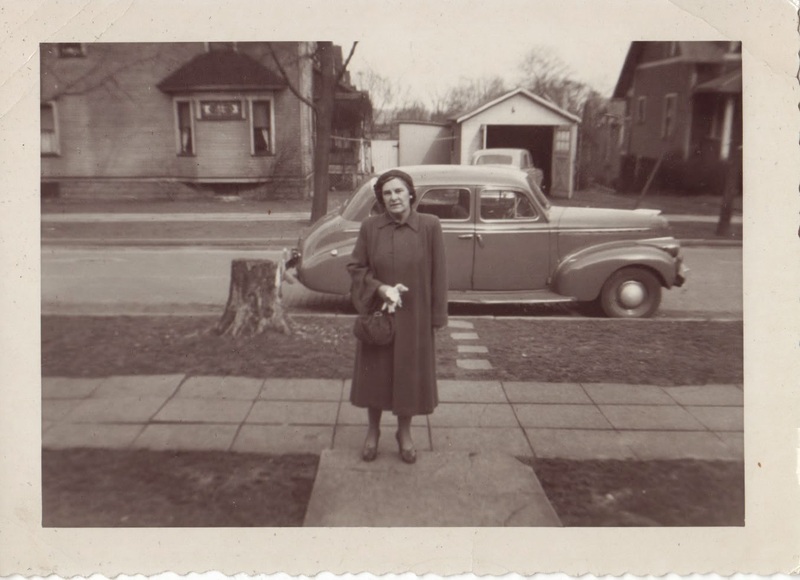 Mary Pepperney Lowry (1902-1980), photograph, taken at unknown location in mid-1940s; digital image, photocopy of original, scanned in 2013 by Joseph Lowry; privately held by Mary McCaffrey, [address for private use], Canton, Ohio. Family of three standing in the backyard. Provenance is Mary Pepperney Lowry to Charles Lowry to Mary McCaffrey.